Shanghai-based GDS Holdings was one of the last data center providers whose shares trade publicly on US markets to report third-quarter earnings, and its growth story remains intact. GDS beat Wall Street expectations for both revenue and EBITDA margins and raised its full-year 2018 guidance. 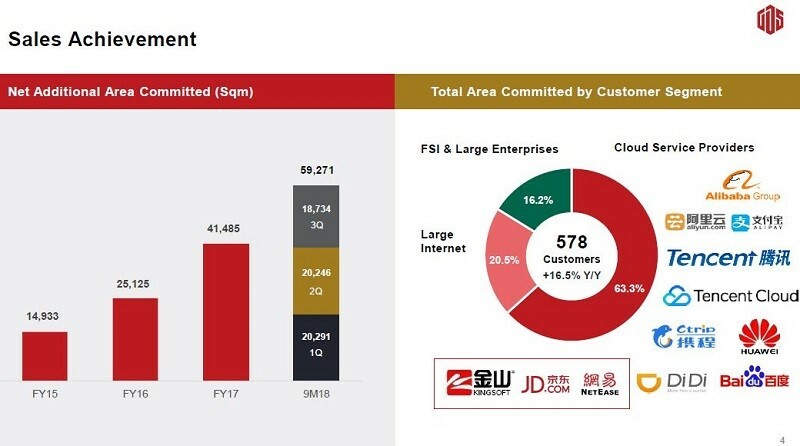 Notably, about half of bookings this quarter came from new customers, including the Chinese e-commerce giant JD.com, video game maker NetEase, and the software company Kingsoft. This was a new development for GDS; its organic growth is typically driven by existing customers like Alibaba, Tencent, Baidu, Huawei, and the major Chinese telcos. The top three customers (all cloud and internet) accounted for about 55 percent of GDS revenue during the quarter. But more cloud, internet, ecommerce, and gaming customer wins are certainly good news for shareholders going forward. On the earnings call, GDS founder and CEO William Huang emphasized that his top customers are all in the early innings of data center deployment, and that demand exceeds supply in China's primary, or tier-one, data center markets. Those customers secure data center capacity based on projections 12 to 24 months out, he said. “The capacity to fulfill their requirements does not exist. It has to be built.” That means customers contract with GDS early enough to execute business plans for 2019 and 2020, giving the data center developer a large backlog and clear visibility of future growth, Huang explained. GDS has a relatively short history as a publicly traded company but a much longer track record in China. Its growth rate has been accelerating ever since it started out at the turn of the century as a provider of business continuity and disaster recovery solutions out of space it leased from third-party landlords. Its business model shifted in 2011, when it started serving high-volume users in new data centers. That strategy evolved into the current program of developing state-of-the-art facilities designed for China's leading cloud, internet, and ecommerce firms. During 2016, GDS developed four new data centers in Guangzhou, Shenzhen, and Shanghai in conjunction with its listing on Nasdaq in November 2016. It’s built four more data centers in Shanghai, Beijing, and Shenzhen since the IPO. New development to meet demand accelerated this year, with eight additional data centers under construction, including three hyperscale build-to-suits in Hebei to serve the needs of one of China's cloud giants. Notably, all GDS data centers are fully fitted out and operated by its staff – as opposed to being delivered on a net-lease basis as powered shells customers fit out on their own, as data center REITs often do in the US. Hebei is a remote market similar to Quincy, Washington, in the US, Dan Newman, GDS CFO, said in an email to Data Center Knowledge. It’s not really a market, nor is it a developed area. 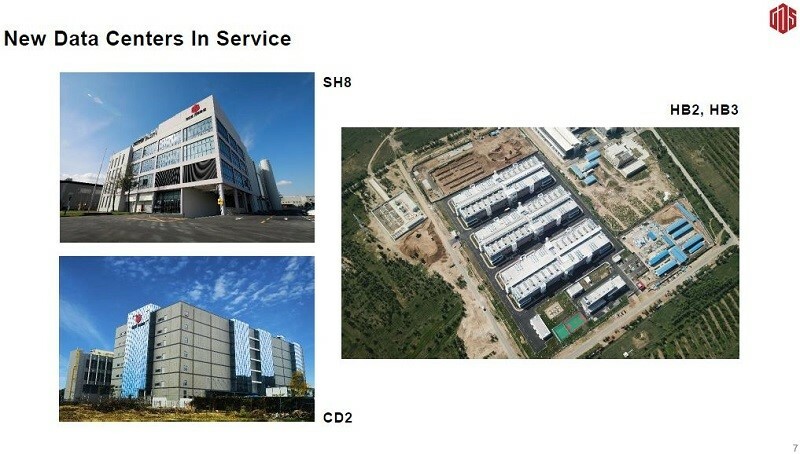 The Hebei data centers are used by GDS customer for application workloads that aren’t latency-sensitive. All hyperscale cloud platforms have hubs like this dotted around China. They typically develop them in-house or in partnership with local governments, and Hebei was the first time one of GDS’s hyperscale customers decided to outsource, Newman said. The company views Beijing, Shanghai, Shenzhen, Guangzhou, and Chengdu as tier-one markets. “Those are the primary network hubs for routing data traffic and interconnection between the major carriers,” he explained. When GDS was going public, about 90 percent of its addressable market in China was in those metros, he said, citing 451 Research. 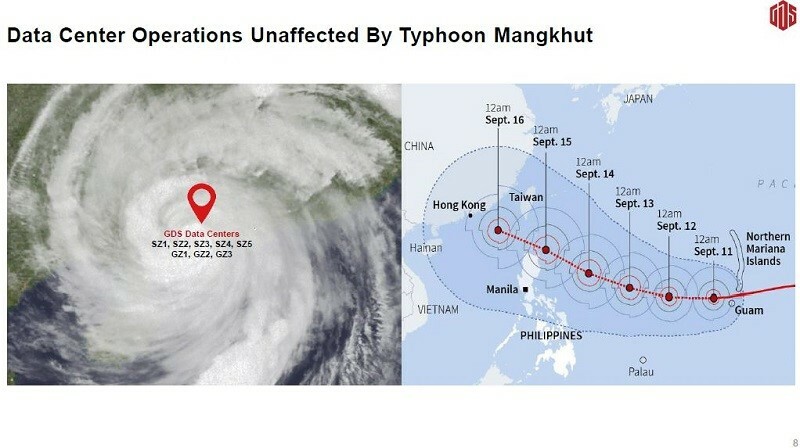 Eight of the data centers GDS the company built were in the storm's path, but there were zero SLA (Service Level Agreement) breaches, despite widespread electrical grid failures, according to the company. This kind of performance is especially important for GDS’s enterprise customers, most of whom are financial institutions, who typically require an uptime guarantee of 99.999 percent, or “five nines,” Newman told us. GDS shares have been highly volatile on Nasdaq, and there are several reasons behind that. Its share price often drops when investors sell off shares of its publicly traded hyperscale customers. But the price swings can create buying opportunities, especially when they are based on uncertainty around US and China trade relations. Almost all demand for GDS data center space and power comes from domestic customers. Its strategic partnership with the American data center giant CyrusOne could over time yield more foreign multi-nationals as they expand into China, adding another source of revenue. The barriers to entry to Chinese data center markets are legendary. It can take several years to acquire state licenses, local approvals, and electrical power allocations required to build a data center campus from the ground up. All that gives GDS a tremendous first-mover advantage, which should remain a competitive moat for years to come. The arduous entitlement process is one of the reasons hyperscale data center demand exceeds supply. Additionally, cloud adoption is still in the early innings in China, especially when compared to US markets. Besides exponential year-over-year growth reported by the Chinese hyperscalers is another tailwind, Newman said. Chinese cloud service providers don’t include revenue from their internal customers in their quarterly reports, but those internal customers also drive demand for data center space. "From our perspective, internal demand is an element of the cloud growth which we see," he explained.